THE STORY - A security guard, having been the sole survivor of a high-fatality train crash, finds himself at the centre of a mysterious theory that explains his consistent physical good fortune. When news of his survival is made public, a man whose own body is excessively weak tracks him down in an attempt to explain his unique unbreakable nature. THE GOOD - An intriguing concept and narrative is boosted by memorable characters and a thoughtful deconstruction of the superhero genre. THE BAD - Uneven performances and awkward moments of dialogue from the inconsistent director. In the aftermath of the rousing success for "The Sixth Sense," M. Night Shyamalan was on top of the world and could have chosen anything as his next project. He chose to follow up the Academy Award-nominated horror film, by re-teaming with Bruce Willis to tack an entirely different genre: the superhero genre. Now, keep in mind, this is 2000. This is all before the Marvel superhero blow-up which would occur in 2008 with the releases of "Iron Man" and "The Dark Knight." Even Sam Rami's box-office smash "Spider-Man" would not come out until 2002. Shyamalan was making a movie that was before its time with "Unbreakable" but in the years since its 2000 release, the film has only grown in stature since then, holding up today as one of the best deconstructions of the comic book genre. David Dunn (Bruce Willis) is a security guard for a sports stadium who has never been sick a day in his life and has miraculously survived a horrific train accident which has left him as the sole survivor. Elijah Price (Samuel L. Jackson) is a comic book collector who was born with Type I osteogenesis imperfecta (his bones break very easily). The two men are nothing alike but when David starts questioning the strange circumstances surrounding his life, it's Price who suggests to David that he may be something different than the rest of us: a modern day superhero. The first thing I took away from M. Night Shyamalan's film on a re-watch was how in control he was of the camera and his patience to let the story unfold. This is not your typical action, superhero blockbuster, with big set pieces, explosions and sky-beams shooting into the clouds above. This is a real-world, human take on what it would really look like if you one day discovered you had extraordinary abilities. Some may say that the film's pacing is too slow or that it spends too much time on David Dunn making the discovery as to who he really is. However, this is the point of the entire movie. It's meant to be full of intrigue and wonder. If anything, it's an opportunity for us to look inward for two hours and ask ourselves "Have I reached my full potential?" Shyamalan's screenplay is meticulous and strikes a perfect blend between doubt and hope. It forces us to ask whether or not superheroes can truly exist among us or are they only characters we read about in a comic book? M. Night Shyamalan was already deconstructing superheroes in a way that audiences had not yet seen before. It's not surprising that the film was met with a mixed reception following the success of "The Sixth Sense." The world was not ready for the superhero genre yet and they were certainly not ready for "Unbreakable." Bruce Willis (known for more often than not, phoning in his performances) does a decent job as the every-man who may or may not be a superhero. His scenes with Robin Wright Penn, who plays David's wife, are truly felt, as they do their best to work through their marital issues, with Wright Penn pulling most of the heavy dramatic lifting. However, it's Samuel L. Jackson who injects the film with the energy it desperately needs, providing comedy and pathos with his wholly unique character from the mind of Shyamalan. David Dunn and Mr. Glass are two characters who have grown into superhero lore on their own as the years have rolled on and a lot of that is owed to the actors themselves but mostly to Shyamalan's vision, which was more on point here during this phase in his career than ever since. "Unbreakable" take an interesting concept and grounds it in reality. 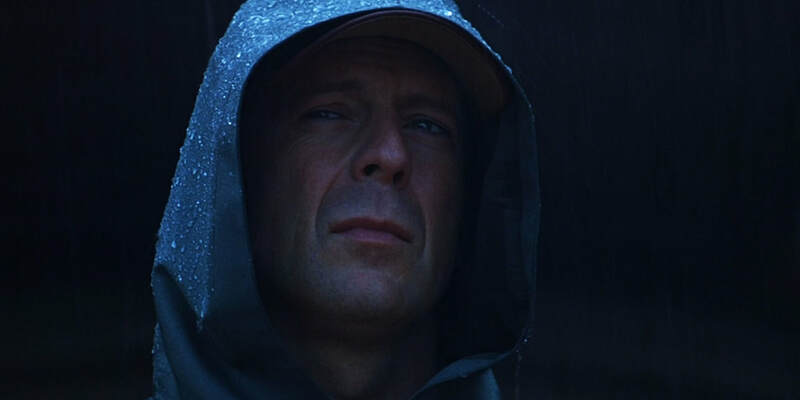 M. Night Shyamalan showed in his career, in the years since "Unbreakable," that the more you gave him to work with, the more he would disappoint. However, with a scaled-back budget and narrative that focuses on story and character, his best tendencies as a director were forced to shine through in this unlikely superhero origin story. Of course, the same criticisms that have followed him his entire career still also come through here: uneven performances (especially from Bruce Willis and his son played by Spencer Treat Clark) and the occasional moment of awkward and unfunny dialogue. However, "Unbreakable" is a film that has only gotten better with time and is still ranked among the writer/director's highest accomplishments.